пролета́рии от вси́чки стра́ни, съединя́вайте се! The People's Republic of Bulgaria (PRB; Bulgarian: Народна република България (НРБ) Narodna republika Balgariya (NRB)) was the official name of the Bulgarian socialist republic. 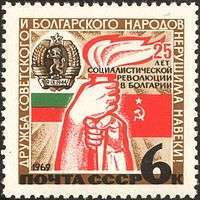 The Peoples Republic of Bulgaria existed from 1946 to 1990, when the Bulgarian Communist Party (BCP) ruled together with its coalition partner, the Bulgarian Agrarian National Union. 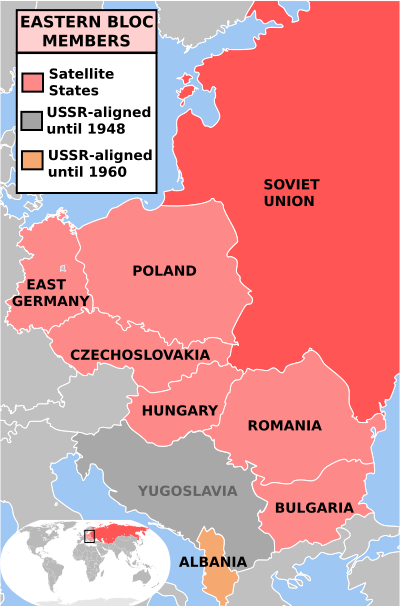 Bulgaria was part of Comecon, a member of the Warsaw Pact and closely allied with the Soviet Union during the Cold War. Bulgarian resistance movement during World War II deposed the Kingdom of Bulgaria administration in the Bulgarian coup d'état of 1944 which ended the country's alliance with the Axis powers and led to the People's Republic being established in 1946. The BCP modeled its policies after those pioneered in the Soviet Union, transforming the country over the course of a decade from an agrarian peasant society into an industrialized socialist society. 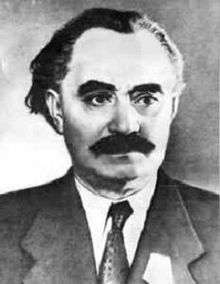 In the mid 1950s, after the death of Joseph Stalin, the conservative hardliners lost influence and a period of social liberalization and stability under Todor Zhivkov followed with varying degrees of conservative or liberal influence over time thereafter. 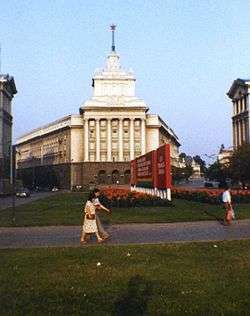 After a new energy and transportation infrastructure was constructed, by 1960 manufacturing became the dominant sector of the economy and Bulgaria became a major exporter of household goods and, later on, computer technologies, earning it the nickname of "Silicon Valley of the Eastern Bloc." 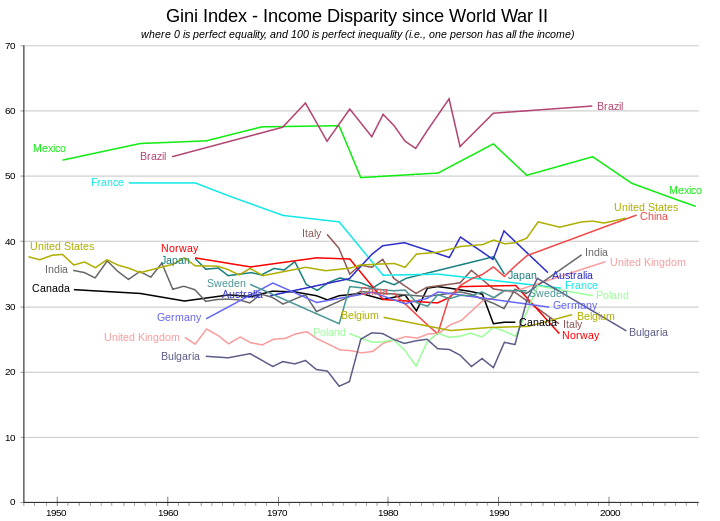 The country's relatively high productivity levels and high scores on social development rankings made it a model for other socialist countries' administrative policies. 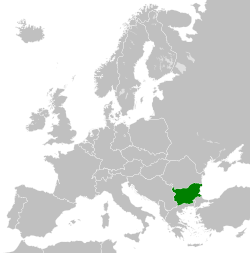 Geographically, the People's Republic of Bulgaria bordered the Black Sea to the east; Romania to the north; Yugoslavia (Serbia and the Socialist Republic of Macedonia) to the west and Greece and Turkey to the south. In 1942 the Fatherland Front was formed. This constituted a mixture of Communists, Socialists and Liberals. The new government began to severely constrain Nazi collaborators. As the war came to a halt, the government expanded its campaign of political revolution to go after economic elites in banking and private business. This only strengthened it when it became apparent that the United States and United Kingdom had largely disregarded themselves with Bulgaria, and further intensified in November 1945, when Communist Party leader Georgi Dimitrov returned to Bulgaria after 22 years in exile. He made a truculent speech that made it apparent the party had no intentions of working with opposition groups who were against their revolution. Elections held a few weeks later resulted in a large majority for the Fatherland Front. The highest estimate for partisans at any one time in Bulgaria is 18,000. The government used force, threats and intimidation, all opposers of the policy were persecuted as fascists and greater Bulgarian chauvinists. Some were resettled as far as Vojvodina after they had been resettled from Pirin to SR Macedonia for unsuccessful Macedonization. After the coup of September 9, 1944 and the end of the Bulgarian government in Macedonia, Bulgaria takes Communist policy of closer rapprochement with Yugoslavia. 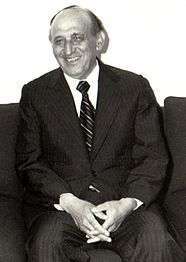 Then Prime Minister and leader of the Workers' Party Georgi Dimitrov initiated the idea for the project for a Balkan federation. For an adhesive unit should serve Macedonia, which should flow in the federation as a united federal republic with pronounced Macedonian national consciousness with boundaries of Pirin to the Shar Mountains. For this purpose, launched policy of forced Macedonization of the Bulgarian population in the Pirin region through conscious change of ethnic self-determination of the Bulgarian population, held by means of administrative coercion and a massive propaganda. In December 1946 he conducted a census in Pirin Macedonia. State authorities instructing the local population in the Pirin region to administrative records such as "Macedonian", including Pomaks, with the exception of those originating from within the country. At its meeting on December 21 Regional Committee of the Workers' Party in Upper Cuma decided to accepted formula for the presence of 70% "Macedonians" in cities column spoken language of census documents to write "Bulgarian" and in villages - mostly "Macedonian". As a result of instructions from the 281 015 inhabitants, 169 444 persons were identified as ethnic Macedonians. As a result, in 1947 between Bulgaria and Yugoslavia signed bled agreement whereby Pirin Macedonia is included in the composition of the federal Yugoslavia, which proceeded to the union of Pirin Macedonia with Vardar Macedonia are abolished visa regimes and removed customs services . Shortly thereafter - in 1948, due to the rupture in relations between Tito and Stalin contract is dissolved. For a while BCP and Bulgarian state reserve contradictory, protivobalgarska policy on the Macedonian issue - until 1963, when the March Plenum of the Central Committee of the Communist Party Todor Zhivkov openly declared that the population in Pirin Macedonia is part of the Bulgarian nation and was political forced by the Communist Party during the Cultural autonomy of Pirin Macedonia between 1944 - 1948 year declared a Macedonian. Zhivkov became the new leader of the BCP, and remained for the following 33 years. The BCP retained its alliance with the Communist Party of the Soviet Union (CPSU), which was now led by Nikita Khrushchev who formally denounced Stalin at the CPSU congress in 1956. With conservative hardliners pushed aside, this brought in a period of liberal influence and reform. 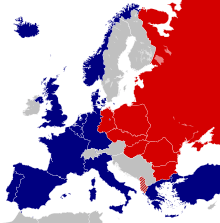 Relations were restored with Yugoslavia, which had previously been shunned by the Soviet Union due to its anti-Stalinist stance, and Greece. The trials and executions of Traicho Kostov and other "Titoists" (though not of Nikola Petkov and other non-Communist victims of the 1947 purges) were officially denounced. The party's militant anti-clericalism was relaxed and the Orthodox Church was no longer targeted as an enemy of the revolution. Yugov retired in 1962, and Zhivkov consequently became Prime Minister as well as Party Secretary. He survived the Soviet leadership's transition from Khrushchev to Brezhnev in 1964, and in 1968 again demonstrated his loyalty to the Soviet Union by taking a formal part in the Warsaw Pact invasion of Czechoslovakia in 1968; that is, he sent a limited number of troops for attendance but not for actually taking part in the bringing down of the Prague Spring. At this point Bulgaria became generally regarded as the Soviet Union's most loyal Eastern European ally. Much later became known that in 1960, in terms of insolvency and the need for repayment of upcoming maturities in II-quarter to 46 million dollars, III-quarter to $36 million and IV-quarter to 25 million dollars to Western banks, Todor Zhivkov personally addressed a written proposal to the first Secretary of the Central Committee of the CPSU - Nikita Khrushchev asking the USSR to purchase reserve bank gained over 66 years - from liberation in 1878 to 1944, from 22 tons of gold and 50 tons of silver against convertible currencies (then capitalist). When selling gold is taken to Novosibirsk, where refined to be aligned with the requirements of the international gold markets and then paid a price $35.10 an ounce, a total of 23 million dollars. Now to 2009 . the value of the sold gold reserves would be 639 million dollars. In subsequent years Zhivkov resorting to several secret operations with gold and between 1960 and 1964 with his permission have sold a total of 31.8 tons, the resulting convertible currency was used solely to repay the debts of Bulgaria mainly to Soviet banks - Eyrobank in Paris and Moscow People's Bank in London. "16th republic of the USSR"
On December 4, 1963, Todor Zhivkov in his capacity as General Secretary of the Central Committee of the Communist Party and Prime Minister of Bulgaria at the time, personally submitted a proposal at the plenum of the Central Committee of the Communist Party, Bulgaria address to the Central Committee of the CPSU issue further closer approximation and future merger of the People's Republic of Bulgaria and the Soviet union, making it the 16th Republic of the Soviet union and thus endangering national integrity and independence of the country. The plenum of the Central Committee assessed the proposal as a remarkable display of patriotism and internationalism, which raised to a new level brotherly friendship and comprehensive cooperation between our country and the Soviet Union .. proposal "to create economic, political and ideological prerequisites for the complete unification of the two present fraternal countries "was unanimously approved by the plenum and signed personally by Todor Zhivkov. The decision on the participation of Bulgaria in the military intervention after the Prague Spring was taken by the Council of Ministers, chaired by Todor Zhivkov, a top secret decree №39 of Ministers of 20.VIII.1968 ground "for providing military assistance to the Czechoslovak Communist Party Czechoslovak people ". in military operation involving the 12th and 22nd Infantry Regiment number of 2164 people and tank battalion with 26 machines T-34. In 1971 the new Constitution is added so-called. "Article 1", which grants the PA as the sole ruling a "leading force of society and the state." Bulgaria signed agreements Helzinksite 1975, which prominently guaranteeing human rights and fundamental freedoms, including freedom of movement, contacts, information, culture and education, right to work, right to education and medical care. However, subsequent events regarding the Bulgarian Turks in the 80s are a direct violation of such commitments. It is estimated that between 50,000 and 100,000 people may have been killed in Bulgaria beginning in 1944 as part of agricultural collectivization and political repression, although there is insufficient documentation to make a definitive judgement. Dinyu Sharlanov, in his book History of Communism in Bulgaria, accounts for about 31,000 people killed under the regime between 1944 and 1989. For Forced labour camps in Communist Bulgaria definitive figures alsoremain elusive. The economy of the P.R.B. was a centrally planned economy, similar to those in other COMECON states. In the mid-1940s, when the collectivisation process began, Bulgaria was a primarily agrarian state, with some 80% of its population located in rural areas. Production facilities of all sectors were nationalised, although it was not until Vulko Chervenkov that private economic activity was completely scrapped. 1 2 Hanna Arendt Center in Sofia, with Dinyu Sharlanov and Venelin I. Ganev. Crimes Committed by the Communist Regime in Bulgaria. Country report. "Crimes of the Communist Regimes" Conference. 24–26 February 2010, Prague. ↑ "1990 CIA World Factbook". Central Intelligence Agency. Retrieved 7 February 2010. ↑ "UK Home Office Immigration and Nationality Directorate Country Assessment - Bulgaria". United Kingdom Home Office. 1 March 1999. Retrieved 2011-11-14. ↑ Шарланов, Диню. История на комунизма в Булгария: Комунизирането на Булгариия. Сиела, 2009. ISBN 978-954-28-0543-4. ↑ Todorov, Tzvetan (1999). Voices from the Gulag: Life and Death in Communist Bulgaria. Robert Zaretsky (trans.). University Park, PA: Penn State Press. pp. 38–42. ↑ "An experiment in living socialism: Bulgaria then and now » pa". politicalaffairs.net. Retrieved 2016-09-29. 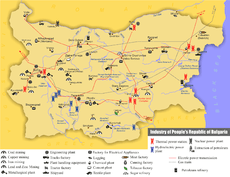 ↑ "Bulgaria: Soviet Silicon Valley Revived". Novinite.com. Sofia News Agency. Retrieved 1 April 2014. ↑ Teichova, Alice; Matis, Herbert (2003). Nation, State, and the Economy in History. Cambridge University Press. p. 138. ISBN 0-521-79278-9.